PCH, Badly Photographed Corvette Edition: 1968 or 1969? The '76 911 Targa beat the '71 911T in yesterday's Dial 911 For Hell challenge, no doubt because fire damage you can't see is more enticing than all-too-visible rust. And now that we're on a Fanatically Worshiped Overpriced Car roll, let's turn our attention to one of the few cars than can rival the Porsche 911 for depth and breadth of its aficionados' single-minded fervor: the Chevrolet Corvette! If we can find a 911 for $3,000 or a Ferrari 365 for $2,500, you know there are gonna be some serious Corvette deals out there... and we don't mean 160-horse '79s or Flashdance-esque '84s! 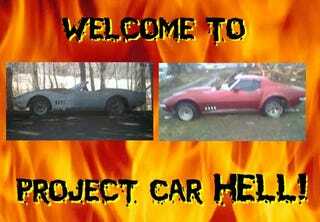 Project Car Hell, Dial 911 For Hell Edition: &apos;71 or &apos;76? A pretty famous musician from Seattle drove a '68 Corvette, and we're not talking about Kurt Cobain here (skip ahead to the last third of the video to see the car). I couldn't find Jimi's old car, but I've got the next best thing: this 1968 Corvette (go here if the ad disappears), with a price that'll make you think you've just dropped 15 purple microdots. Yes, just $3,000 and this somewhat indistinctly photographed vehicle could be yours (winter photography tip: for added artistic effect, place the car against a snowy background, with the sun behind the car). The seller is clearly burned out on this project, judging by the exhausted tone of his description: "needs to be restored have lots of parts proj3ect started but must go asap please get out of my drivway my loss is your gain thanks." Questions, questions... does it have an engine? a transmission? paperwork? an interior? One thing you can count on: the body won't be rusty! Wouldn't a 4-speed '69 Corvette be nice, say one with an L72 427 under the hood? And nicer still if you could get one for $3,900? Well, that's not happening, but what is happening for that price is this '69 Corvette (go here if the ad disappears). It's a 4-speed car, in the sense that it has a clutch pedal. And more good news- it doesn't have some busted-up 307 stinking up the engine compartment. That's right, it's a blank slate, a clean page- you're free to put anything from a Buick straight eight to a GMC Twin Six in this car! It will need some other stuff, too; even the seller is quick to describe it as a "BIG project." The exterior photos were apparently taken using an early Soviet vacuum-tube digital camera, but we can make out the twin horrors of "really UGLY flares" and aftermarket hood. Oh yes, and don't think you'll be getting the chrome on the fender grilles, because those are staying in Des Moines!